From the shrinking wild placesto the sprawling cities, the signs are everywhere - the coming of Apocalypse is certainty. Gaia needs Her warriors more than ever these days. But the Garou Nation is beset on all sides - from the Wyrm's many minions, the Weavers machinations, the slow decimation of the wilderness, and perhaps even from within. 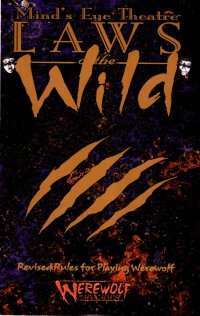 Laws of the Wild Revised is the revised and updated rulebook for playing the Garou in live-action. Based on Werewolf: The Apocalypse Revised, this book carries the new material and the advanced storyline. Everything a player needs to learn the basics of the Werewolf setting, create a character and begin playing is contained within.